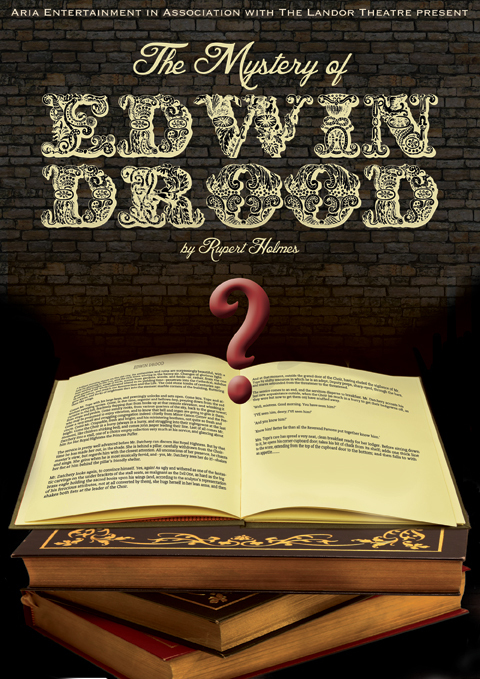 The thrilling and comical musical The Mystery of Edwin Drood is playing at the Landor Theatre from 11th April-5th May. It is written by Rupert Holmes and based on the unfinished novel by Charles Dickens. The musical won 5 Tony Awards including Best Musical and 11 nominations in 1985 and after its huge success transferred to London's West End soon after starring Ernie Wise and Lulu. Edwin Drood is a play within a play. With a Chairman at the helm the actors of the Theatre Royale re-enact the story of Edwin Drood for the delectation of the audience! It is set against a backdrop of the Great British traditions of music hall and pantomime where the actors vie for the boo's and hisses and sympathies of the assembled audience and YOU get to decide the outcome that is The Mystery of Edwin Drood. The cast is headed by Natalie Day (Les Misérables) as Edwin Drood, Victoria Farley (Les Misérables) as Rosa Budd and Daniel Robinson (Jekyll & Hyde UK Tour) as John Jasper with former Coronation Street star Wendi Peters (she played Cilla Battersby-Brown) as Princess Puffer. The cast also includes: Loula Geater (Helena Landlass), David Francis (Neville Landlass), Denis Delahunt (Chairman), Richard Stirling (Reverend Crisparkle), Oliver Mawdsley (Horace), Mark Ralston (Bazzard), Paul Hutton (Durdles), Tom Pepper (Deputy) and Ben Goffe (Harry Sayle). Edwin Drood is being directed by Matthew Gould with James Cleeve as Musical Director. The show’s Costume Designer will be Jean Gray; Set Design by Natasha Piper with Lighting Design by Maria Kearney.